"To make sure she has not exceeded her limit, a serious clam digger is 'counting clams' before heading home." Artist comment: "I really enjoy digging for clams. Washington State has certain times set aside to go get razor clams on the coast. The amount of clams per 'dig' is also limited. However, you can go out day after day during the season. In this case, the limit was 15 clams each person, each 'dig'. The painting is soft pastel on Canson Mi-Teintes paper. After sketching the scene with a neutral gray, I started with the background, including the reflective sand. Then I painted the subject and reflections. I finished with the net and it's reflection." 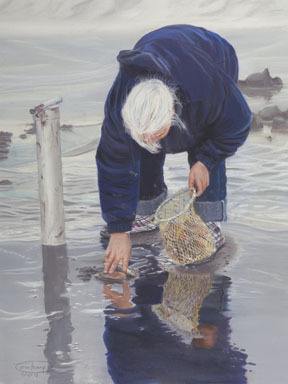 "Counting Clams" is a limited edition, giclée print from an original pastel painting by Carol Thompson. The edition includes 3600 authorized, signed, limited edition prints (3500 numbered and 100 artist proofs). Release date is October 2014. Image size and substrates vary. All prints are signed and numbered by the artist and include a certificate of authenticity. Paper prints are shrink wrapped on foam board. Canvas prints are coated with a protective spray.